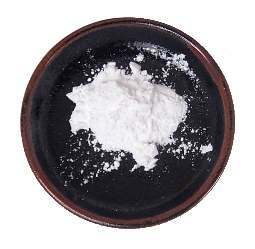 baking powder Baking powder is a mixture of one or more acidic salts and baking soda, an alkali. These two compounds react when they get wet and release carbon dioxide gas bubbles. These, in turn, cause baked goods to rise. Baking powder is perishable. To test a batch, add 1 teaspoon to ½ cup hot water. If it doesn't bubble, throw it out. Look for baking powder among the baking supplies in most supermarkets.